Abso-total-lutely! Exactly what we’ve been saying all along. We agree with what the president said. For America, the immigration nation, to be building walls to keep those legitimately seeking refugee status from having the chance to make their case is unconscionable. It is inhuman. It is Soulless. It is against everything that actually makes America great. All our ancestors came to America from somewhere else, most of them pretty recently. Those of us whose ancestors came freely owe a continuing debt to those who repaid their own debt by allowing our families the chance for a new home and for new opportunities. With no way to repay this debt to the past, we are obliged to repay to the future. This is the American way. Immigration is how we grew to be a leader among nations. Continued immigration is the only hope we have to persist in our leadership. And it’s also brought us the tasty food that gives this country Soul. Were the President’s speech writers intentionally trying to co-opt the message of our Soul box tribute to the immigration that has always made America great, or did they just arrive where they did by their own hard work? We may never know. But we won’t sit silently while they try to replace the goodness at the heart of the American Soul with trumped up fear and hate. So through Sunday, free Soul pins with any purchase, good deals on both the Original Soul box and the Mini Soul box, too. No coupons or codes needed for the free Soul pin with purchase or the good deals on Original Soul or Mini Soul boxes. In our stores, or online at penzeys.com, these offers are automatic for everyone. Today we are also introducing our already-scheduled free half-cup jar up to a $10.49 value with any purchase of $5 or more. In stores just show this email or the coupon above. Online, anytime after you’ve reached $5 in spending your cart will automatically mark the 1/2-cup jar with the highest value as free. It’s easy. And my email address is down there below if you want to tell me I’m wrong, but if you want to have success with being for anything other than robust American immigration you need to come up with something new. Immigrants absorb crime, receiving more than they commit, leaving the rest of us safer for their presence. America has 1/7th the immigrant population of Germany with lots of virtually empty states out West; we have the room. No human is illegal, but our immigration laws are. We closed open immigration for the purpose of keeping America a “white nation” to please the klan; that’s not constitutional. And since it’s become the new thing to quote Animal House in legal proceedings, “We need the dues.” The arc England and France were on from the start of the 20th century to the start of the 21st is the very same arc America is now on. Economies are no longer simply about production, but equally about consumption. Clearly we Americans are maybe even too good at this, yet still to not be playing a distant third to India and China at the end of this century we simply need more Americans. Refugees make great Americans. Let’s gather in as many as we can. They need help. We can give it. Everybody wins. Tasty food, too. And the big Original Soul box is well worth a look. 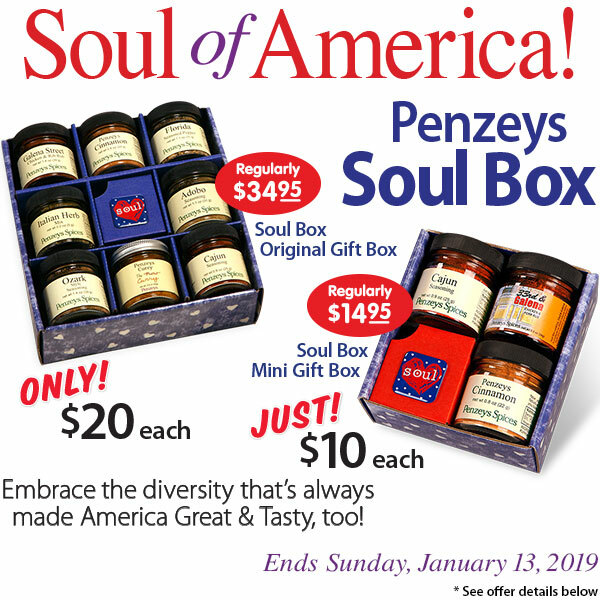 It includes the Soul Brochure and Tip Cards as well as 8 great tasty immigration contributions; each a tasty gift to America’s Soul. Buy one to keep and one to share and shipping is free. Plus an extra Soul pin free and a half-cup jar of your choice as well. Act now. Beat the end-of-offer rush. 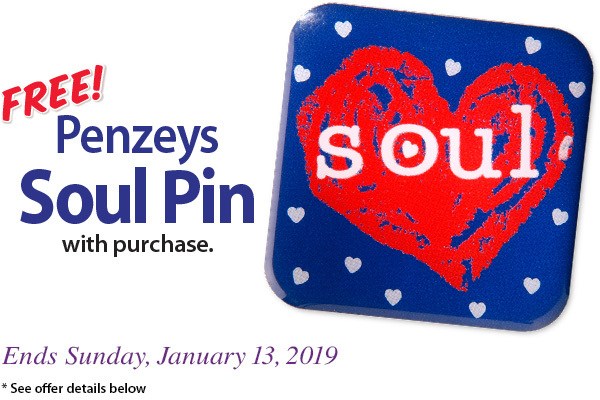 Receive a free Penzeys Soul Pin with every purchase. Not applicable to prior sales, not valid with other offers. While supplies last. Offer ends midnight Sunday, January 13, 2019. While supplies last. No cash value. Standard shipping rates apply. Offer ends midnight Sunday, January 13, 2019. 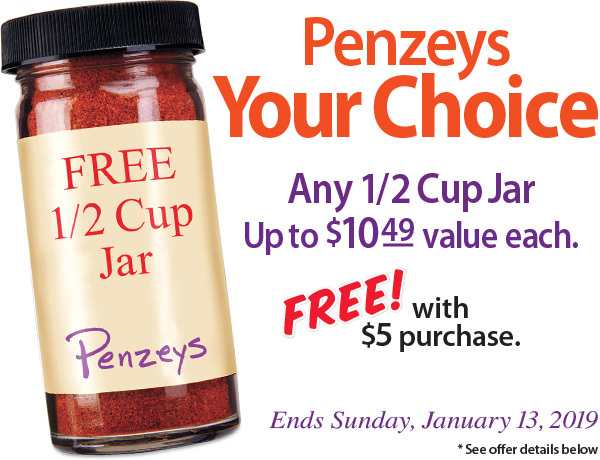 Limit one free any Penzeys 1/2-cup jar $10.49 or less per household during run of Your Choice promotion. Minimum $5 purchase required. Not applicable to prior sales, not valid with other offers. While supplies last. Coupon must be presented at time of purchase. Call 800-741-7787 to redeem by phone. Online, visit www.penzeys.com and shop normally. With $5 spending, the most expensive 1/2 cup jar up to a $10.49 value will automatically be free in your basket. Standard shipping rates apply. Offer ends midnight Sunday, January 13, 2019. This email was sent to James@JamesKiester.com. If you no longer wish to receive these emails you may unsubscribe at any time.